This has been on my mind for a long time. I’ve been pondering whether to change the spelling of “Zeal”, which has an actual meaning, which might not be fitting to the series, to “Ceal”, which is more original. With today’s update, that change is official. From now on out, the name of the series is “The Chronicles of Ceal”. Also, I’d like to use this opportunity to officially make the Puky the mascot of Ceal. These curious and helpful Iserial beings are a trademark to the world of Ceal, and appear in each and every last one of the stories and games centered around it. Information about another exciting tri-Tail board game is available now! This time, it’s a game set in the Ceal universe: Ceal ~ Crystal Grid. This game is an advanced board game with lots of strategical depth. It goes from 2 to 6 players, and will keep you busy the whole afternoon (and maybe most of the evening too, if you like to plan your moves carefully). It’s hard to master, but easy to learn, and will provide dedicated gamers with long hours of tactical fun. I hope everyone has as much fun playing it as I had making it. Be of great cheer! Sometimes, inspirations just strikes, without mercy, and you find yourself toiling the away the evenings and weekends away to create a new game. But it’s worth it. Any time. As such, tri-Tail is now proud to present: Ecchnasi - a board game about wolves and dominance. All you need to play it is an 8x8 board, 16 white pieces, and 16 black pieces. Try it out, and tell me what you think! Have fun, and be of great cheer! In the last couple of months, I’ve been working nonstop to create refined and polished prototypes for Ceal ~ Crystal Grid and Ecchnasi. The Effort has paid off, and now these games are even more amazing than before. I am now searching for a publisher, to help me reach a broad audience with these games, so that they can bring color to the world. Also, Woo! The birthday of this website was on February the 7th. Congratulation to your first official birthday, tri-Tail! Thanks to all of you people! Be of great cheer! The first step is done! Information about the world of Zeal is now freely available at our website about The Chronicles of Zeal! And more is on its way! Stay tuned for next our update in April 2015! Stay tuned for our next update in March 2015! More information about the world of Zeal is available now! Read about the eight unique species of Zeal on the Species Page. It may seem like overkill to make a team-page for a single person. However, since we hope that the tri-Tail team will grow, we think of it as an investment into the future. Want to join the dream, and help make the world of Zeal come true? Contact us at info@tri-tail.com ! In case you are curious: The first thing we intend to work on right now is The Crystal Seal. The other tales are roughly outlined and provide the historical background which sets the stage for this latest part. Also, the list is not finite. The four tales outlined there are merely a starting point, and many more stories can, and hopefully will take place in the world of Zeal. I’ve been working hard to make the Chronicles of Ceal available to a broader audience. Now, after weeks of preparation, the big day is finally here! The Chronicles of Ceal are now live on Patreon, Facebook and YouTube! Check out awesome content, videos, and ways to support me. I am hoping that this campaign will help me raise some funds to secure the future of the tri-Tail projects, for I would very much like to dedicate a larger share of my time to it. If this works out, then I’ll soon have the resources required to provide you all with even more awesome stuff. So there’s something for you all to look forward to. Until then, be of great cheer! I’m keeping myself busy working on the Crystal Seal Chronicle, so I’m afraid I don’t have a lot of time to run website updates. However, I still took a few hours to update the World section of the Chronicles of Ceal to incorporate fancy rendered shots of the continents. Also, I slightly changed the name of one continent to avoid confusions with another element of the universe. Can you guess which one? Enjoy, and be of great cheer! After a year-long working holiday in New Zealand, I am now finally back, and with the first book of the Crystal Seal Chronicle written, and currently undergoing review, I now finally have time again to work on the Chronicles of Ceal. For starters, I have finished creating original artwork for each of the eight sentient species of Ceal. Check out the Species section! Also, for those of you interested in my adventures in New Zealand, I have created an entertaining travel blog, which has the proportions of a novel, but is entirely free of charge. Enjoy! For now, be of great cheer! Immerse yourself in a world of epic proportions, a science-fantasy universe populated by diverse and original species, interacting with one another in harmony… or not. The history of Ceal is characterized both by gruesome conflicts born of ambitions and misunderstandings, as well as glorious golden ages brought about by collaboration and passion. The world of Ceal is an exotic place where remnants of forgotten ages are waiting to be discovered by brave explores. It is a world where adventurers can go on jaunts around the globe, meeting new friends belonging to all sorts of fascinating species. And above all, Ceal is permeated by a mystic force known as Iserialogy that allows those who are capable of wielding it to perform mighty feats by force of will alone. 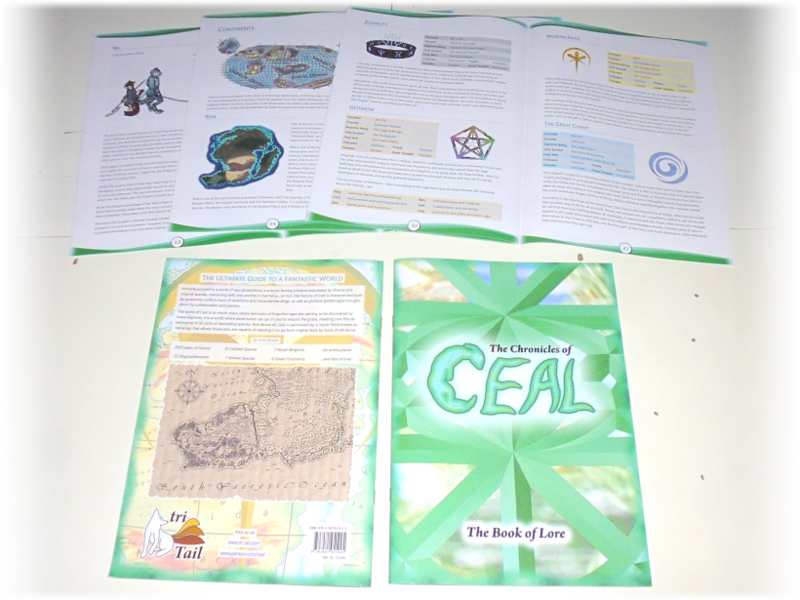 In order to raise funds for the Chronicles of Ceal, these colorful and detailed 40-page books full of artwork and in-depth lore about the world of Ceal are now on sale! You can even purchase multiple copies to save on shipping costs and get a little reward on top. If you are interested, send a mail to info@tri-tail.com. Either way, be of great cheer everyone!